WhatsApp Latest Update allows you to Send Document File Over Chat : The Feature we all people are being waiting for is finally here the new feature with which you can send document over your fave-rate chatting application WhatsApp. This feature is launched for both the Ios and the android device and so the exchange device will work. Now the work is much more easier and you have no need to go on some other mail services to send your document over to another person. 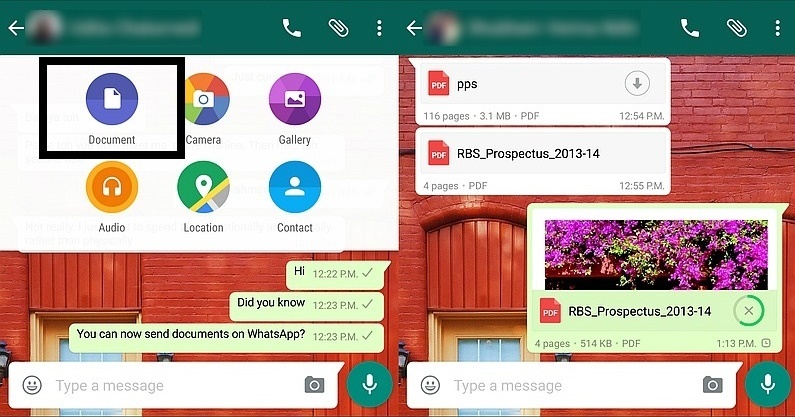 You can now just send you document on WhatsApp. This is going to make your much more easier and fast. 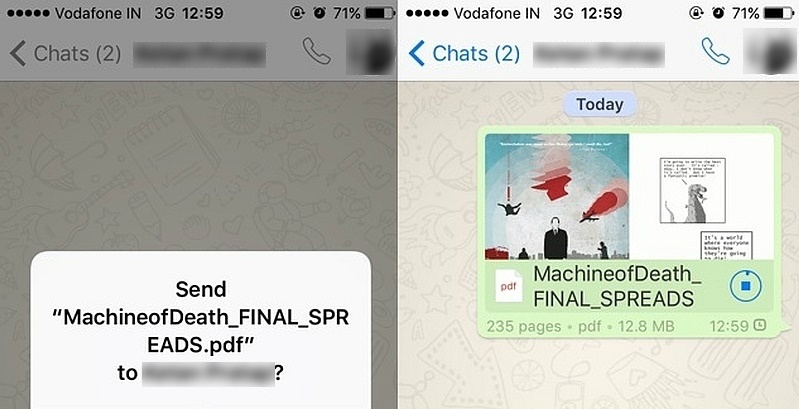 The document you send over WhatsApp no specification it could be a Docs file or can be a Pdf or any other file. This latest feature has completely secure for sending your documents so, you don’t have anything to worry about anything. Now, for Android user WhatsApp version 2.12.453 that’s now available from Google Play only for some users shows a ‘Document’ option in the Attachments section from where you can send the document. Not all users with the same app version are able to have this option at the moment only a few selected one have the advantage for this option. However, most users on the latest upcoming WhatsApp version will be available from the company’s official website – v2.12.489 – are able to see the option in the current stage, indicating a server-side update. For now, users can only send pdf files and docs files but the file support other file formats in the upcoming updates as we can presume. For the meanwhile, WhatsApp for iOS device and users version 2.12.4 lets users share photos or videos from other apps such Google Drive, Dropbox or Microsoft OneDrive with all the attachments. Users are just required to open “Photo/Video Library” and just tap on to “Choose from another app…” to share there files. In addition, users can now pick solid colors for chat background as a bit of anew feature. Besides an improved design for browsing your send and received photos and videos, And one bit of a new update for iOS users and device that they can even zoom in videos while they are playing.